Why it matters: Transparency, expertise, and diversification are key considerations. Changing market and economic conditions have refocused attention on the prime brokerage services at major global banks. The growth of the size, scope and complexity of the hedge fund industry has resulted in some banks greatly expanding their prime services capabilities. At the same time, however, various regulatory changes since the 2008-9 financial crisis have complicated the prime services landscape, as the more stringent capital requirements for prime services has made these lines of business less attractive at times for some investment banks. One of the major results of this growth and evolution in the industry has been the creation of more competition and differentiation in the provision of prime services, including a greater emphasis on bespoke solutions. Current market conditions have created a valuable opportunity for alternative asset managers to strengthen and/or reposition their relationships with their prime services partners. This might include an assessment of whether current partners are meeting their needs, and even whether a manager should in fact diversify its prime services partners according to the nature of each type of transaction. However, before doing so, managers should review three key considerations when selecting their prime services partners: 1) transparency; 2) strengths and expertise; and 3) diversification. One of the most significant changes in the prime services space since the global financial crisis has been greater transparency with respect to services and fees. This transparency has come as a result of changes in regulation around the world, such as the Markets In Financial Instruments Directive II (“MiFID II”) in Europe, but also from demands from hedge fund managers for greater accountability and insights into the fees they pay. With prime services now itemized and unbundled, asset managers now have the opportunity to view the full range of prime brokers’ full business and capital markets services. This puts them in the advantageous position to develop holistic relationships across the prime broker’s organization. It’s a win-win situation. The transparency of a given prime broker gives both the broker and manager the opportunity to develop a more effective relationship, with the broker better able to develop a deeper understanding of the manager’s firm and strategy, and the manager in a position to leverage the other operational competencies of its broker. Service elements: Some prime services brokers have greater efficiency and expertise in certain functions, including synthetic equity financing, risk analysis and electronic trading platforms. Securities specialization: Service providers may be specialized in different asset classes and/or investment types, such as fixed income or equity. Geographic reach: The scale and regional scope of a prime service partner’s organization can be a determinant of how effective it can be when a manager’s prime services needs cross borders. An investment bank with a strong pre-existing global franchise or business in a particular region may be more effective for transactions of an international nature, for example. Appetite: Not all banks view the value of their prime services business the same way. With bank capital requirements under narrower restrictions because of financial crisis-driven regulatory reforms, the amount of their balance sheets banks wish to devote to their prime services business can vary significantly from firm to firm, and can even vary according to current market conditions. As the prime services industry has evolved and expanded over the past decade, so too can the approach managers take in their relationships with their prime services partners. Just as no two prime services partners are the same, no two prime brokerage transactions are the same. Consequently, the level of transparency and differentiation currently in the industry gives managers an opportunity to build a portfolio of prime brokers who each represent the optimal solution for a given transaction. In other words, the current prime services environment offers clients a much higher level of customization and flexibility. Such an assessment could be based on factors such as the partners’ areas of expertise, geographical reaches, their appetite for different lines of business and pricing and margin rates. This should be done not only to achieve the optimal service levels for each transaction type, but for business continuity reasons as well: reliance on a single prime broker can be risky should the broker’s firm decide to offload a manager’s business. A truly global bank: Scotiabank’s history dates back to 1832 – the year when The Bank of Nova Scotia was founded. For the duration of the 19th century, and throughout the next, Bank branches expanded across Canada, into the U.S., and overseas. Its commitment to being a local bank (centred in one of the world’s most stable financial markets) with global reach has not wavered. Scotiabank is considered a leading global wholesale bank, with offices in North America, Latin America and the Caribbean, Europe and the Asia Pacific region. The Bank’s ability to execute transactions across geographical boundaries means that Canadian asset managers are no longer limited to using non-Canadian banks for their international transactions. Diversity of services: Scotiabank offers a comprehensive array of prime services – including synthetic prime brokerage, foreign exchange execution and risk management, analysis and reporting – which positions the Bank to act as a manager’s principal prime services partner or to deliver on a manager’s specific prime services needs that may not be optimally delivered by any of its current prime services partners. For example, an asset manager looking for a partner with specific global expertise might benefit from Scotiabank’s strength in this area. 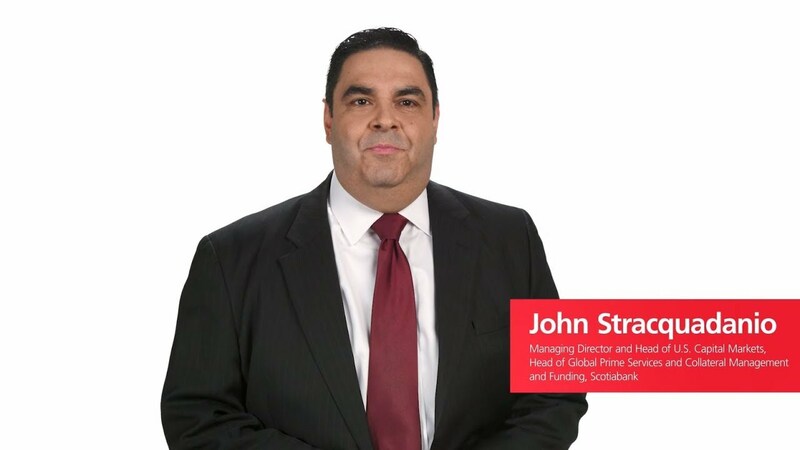 Structural integration: Scotiabank’s Prime Services and Collateral Management and Funding (“CMF”) group are managed under the same capital markets umbrella. The CMF group handles repo financing for Scotiabank’s clients as well as the Bank’s own trading positions. Having both of these financing businesses in the same management framework helps Scotiabank and its clients better ascertain their financing needs holistically and which lines of business might be better suited for a given transaction. As Canada’s international bank, Scotiabank can leverage the broad scope and comprehensive coverage of its prime services business to bring added value to clients in this increasingly pivotal aspect of the banking and financing process. 1. Laura Noonan, “Jump in prime brokerage boosts investment banking,” The Financial Times, May 23, 2018. 2. Lindsay Fortado, Laura Noonan, “Banks raise bets on prime broking for struggling hedge funds,” The Financial Times, January 9, 2019.